The Paris climate agreement finally comes into life. The main points are: making multi-level governance operational, setting up target assessment mechanisms and developing tailored climate finance services to move forward. 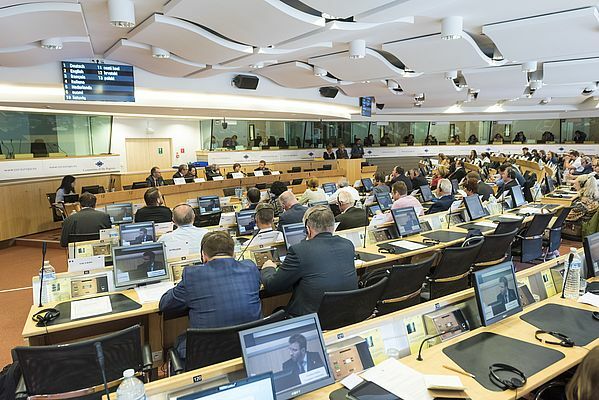 These are some of the issues local and regional leaders discussed in Brussels during a high-level debate at the European Committee of the Regions with the presence of members of European Parliament, the European Commission and the European Investment Bank in addition to Moroccan authorities. The COP22 world climate summit in Marrakech next November is to take the Paris agreement from adoption to action. Paris agreed to limit the global average temperature increase to well below 2°C and track progress through a robust transparency and accountability system. It also acknowledged for the first time the importance that non-state actors play in the fight against global warming, referring in particular to regions and cities as they implement around 70% of climate related decisions. On the road to the next global climate summit in Marrakech, the European Committee of the Regions is leading the debate on how to convert the Paris pledges into concrete results on the ground. At stake are the role cities and regions play in combatting climate change and the further support they need to implement climate mitigation and adaptation measures locally. Francesco Pigliaru, President of Sardinia and of the Commission for Environment, Climate Change and Energy of the CoR stated: "The COP22 will open a new era: an era of improved cooperation with us, the "non-party" stakeholders. We now need to implement the agreement within our respective constituencies. Further assessment and support mechanisms are to be developed to make sure all countries abide by the commitments they made in Paris. The COP22 will have to make these newly created mechanisms operational. The positive and ambitious spirit of Paris has to be maintained as these instruments are rolled out”. Francesco Pigliaru is the rapporteur of a CoR opinion to be adopted next October on Delivering the global climate agreement – a territorial approach to COP22 in Marrakech . “We need to convert what we have committed to into bankable projects,” said Esther Badiola from the European Investment Bank. EIB has EUR 100 billion for climate action loans until 2020 at the disposal of local and regional authorities but also private actors. “We call cities and regions to request information and benefit from our innovative climate finance products which are tailored to the necessities of each specific case”, added Esther Badiola. The Italian Member of the European Parliament Simona Bonafè declared: "Tangible measures are expected in order to reach the objectives set by the historical and ambitious Paris agreement. Regions and cities will play a central role in the transition towards a low carbon society, particularly in the transport and buildings sectors, which are not covered by EU’s Emissions Trading System. The investments required to make the change possible are impressive. More synergies are needed between public and private financing as well as between different European funds". With the support of Moroccan authorities, the CoR is to organise a cities summit during COP22 to continue the discussion on the implementation of the Paris climate agreement, reinforce climate multilevel governance and promote the Covenant of Mayors in Morocco and beyond. Around 30 members of the CoR recently became Covenant of Mayors Ambassadors, a group of local and regional leaders engaged in promoting the benefits of joining the Covenant, EU's largest energy and climate initiative.